We all remember the many outings, events, bowling tournaments and softball games sponsored and organized through the Employee Activity Committee. 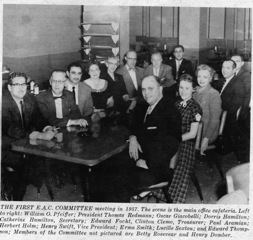 The first EAC was established in 1957, and from that foundation flowed all of the wonderful family and employee events that followed over the next 35 years. Paul Aramian, pictured here on the left in the back, is still active in our MNB Alumni event.